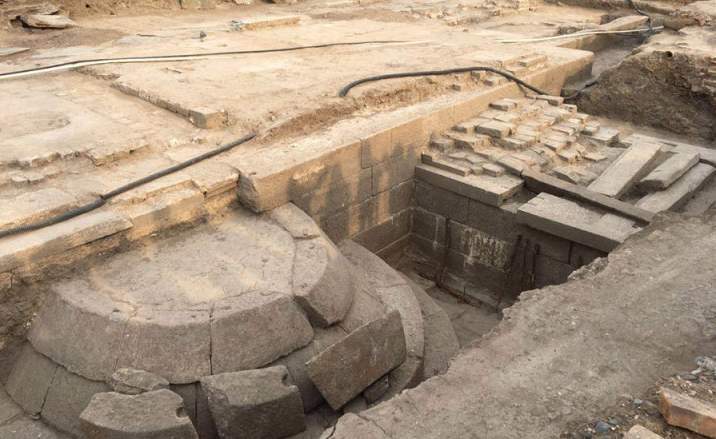 Yuanmingyuan Site, known as the Old Summer Palace, has become an archaeological highlight this year for 2 major finding were unearthed there. One is Zibi Shanfang site, the other one is Ruyuan Garden site. According to Beijing Municipal Bureau of Cultural Relics, 187 archaeological exploration projects have launched this year which led to 7 major discoveries wherein Yuanmingyuan seized 2 itself. The latest finding is in Zibi Shanfang site. After 1-year-long exploration and hard work, a bundle of buildings and architectures have been unearthed by archaeologists there recently. A large blank on the original blueprint has been fulfilled with gates, walls, royal dock and palaces. In July 2017, thousands of historical relics have been discovered in Ruyuan Garden site. Regarded as national treasures, the relics, including famille rose tiles, stone inscriptions written by Emperor Jiaqing in Qing Dynasty have been well reserved now. For had been burnt down by the invading Anglo-French military forces, Yuanmingyuan Garden was once considered as mere ruins, however, the recent discoveries reveal that rich cultural resources underground are going to fulfill the whole Yuanmingyuan Garden’s composition, as well as lend the capital city’s enchantment.